Just in the last few years of my life, I’ve come to regard food in a very high manner. Growing up, I ate food that was convenient rather than healthy, cheap rather than nutritious. We ate from cans, boxes, and a freezer filled with highly-processed, convenient snacks. My parents owned 8 vending machines, and I would often spend the money I earned working with my mom to buy a candy bar, cookie, or soda pop. I used to eat sugar-filled empty-calorie cereal with milk for breakfast…every morning. When we moved to Minnesota my sophomore year in high school, we had to eat out every day for breakfast, lunch, and dinner the first two weeks we were there. I thought it was going to be the greatest thing. It got old after about five days. Eventually, everything homemade sounded better to me. Now, don’t get me wrong, we didn’t eat that way all the time. There were plenty of times, especially when I was younger than 7, that we ate what my mom prepared on a daily basis, including Cornflake Casserole, roast with potatoes and carrots, and Sloppy Joes. But I think my mom got busier and more tired as I got older (I’m the fifth child out of six), so we started eating food that was much easier to prepare. 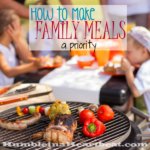 After getting married, and subsequently living on a very tight budget, I learned how to prepare many foods at home while trying to spend the least amount of money. I have been amazed at just how tasty simple ingredients can become when seasoned and cooked properly. I love to cook now, so it’s no shock that I am going to cook for my babies, whether 6 months old or 16 years old. The reason why I’m writing this is because I’m going to be posting more about feeding children, and I don’t want anyone to get the wrong idea. I am not here to reprimand you for feeding your kid cheetos for a snack or giving your baby jarred baby food at 8 months old. Instead, I just want to give you some insight into what has worked for me when I am feeding my own kids. 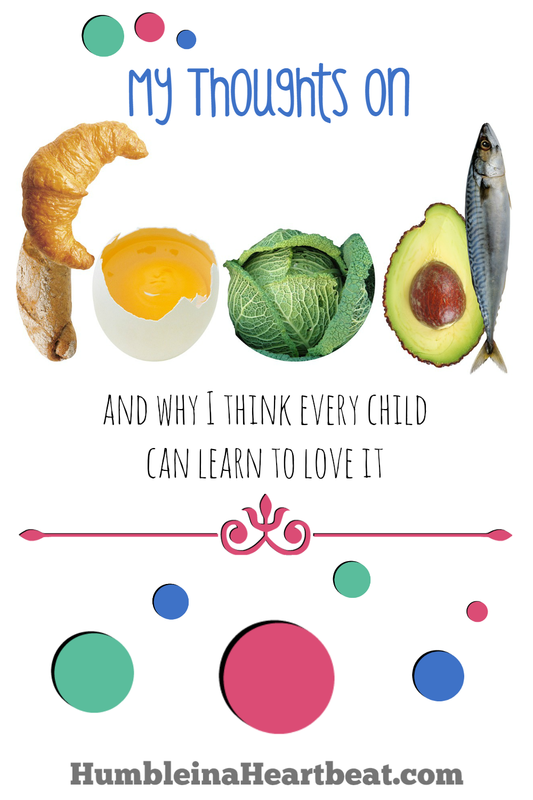 Every kid is really different about food. I get that. But I think some of my ideas could help you to get your child to eat more than 5 peas off their plate. Or to at least stop dropping their food on the floor for the dog to lick up. Maybe my kids got their food loving ways from the Italian side of my husband’s family. Or maybe, just maybe, I am actually doing something right in this department. If I help in any way, please shoot me an email because I’d love to hear your successes and share them here! Just you watch, since my blog is called Humble in a Heartbeat, I’m probably going to pay for this later. 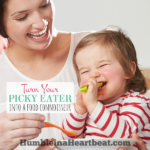 Maybe next year I’ll be begging you for advice on how to get my kids to eat just one pea! My husband’s side of the family is Italian too (well, one quarter of it anyway! The other three are Irish, Native American, and Spanish) and like a true Italian he likes to eat and could eat pasta any day of the week! Our daughter is the same way, although when she was a baby/toddler we didn’t have problems with her and vegetables – in fact she was stealing vegetables from my plate and sneaking her meat over to me! The Italian food love thing is real. 🙂 My husband’s grandma is 100% Italian, and my husband is 1/4, I guess… Anyway – that side of the family can flat eat! They LOVE food! It’s insane. Haha. I bet family gatherings are really loud as well! Oh I am excited to see some of your ideas! 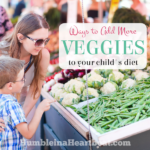 I am always looking for new ways to implement fresh and healthy foods into my kids diet! Hey, Jen! I’ve been thinking about you today. I hope you guys are ok down there! It’s a challenge, but I hope my ideas can help you and other mamas! 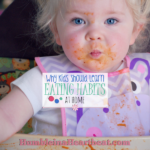 I eagerly talk about my kids and their eating habits. I don’t struggle too much with feeding them because my oldest has an anaphylaxis dairy allergy. Because of that allergy, we never entertained the idea of fast food or eating out. Everything was made from scratch and there were/are a lot of vegetables in her diet. I’m eager to see what you share! 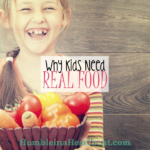 It is so refreshing to hear that you actually talk to your children about eating! I love it! 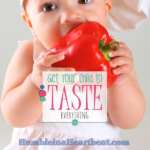 We don’t eat out either, so I don’t think our kids will crave or desire those junk foods or fast foods much. I would like to hear more about your daughter’s allergy, Jennifer.